Golden Slipper winner Mossfun finished unplaced and undefeated Deep Field didn’t trial — but there are no alarm bells at Team Hawkes. During an eventful barrier trial session at Rosehill Gardens on Tuesday, Mossfun could finish only fifth behind talented filly Press Report and Thousand Guineas winner Amicus in a 903m heat. Co-trainer Michael Hawkes said Mossfun pleased the stable with her trial effort. “She went good, did everything right, travelled nicely, but then got hemmed in on the fence and couldn’t get out until too late,’’ Hawkes said. Mossfun hasn’t raced since winning the Golden Slipper last April. She was in full work during the spring but did not race due to a virus. “She was ready to race last spring but we just ran out of time,’’ Hawkes said. Hawkes said Mossfun is likely to resume in the Group 2 Light Fingers Stakes at Randwick next Saturday, while freakish sprinter Deep Field is likely to be sent to Melbourne for the Group 1 Lightning Stakes at Flemington. Deep Field was due to trial in a 903m heat on Tuesday but instead the Hawkes stable galloped him earlier in the morning,. Team Hawkes took Deep Field from a 10-length maiden win on debut to a Group 2 success in the Tab.com.au Stakes at Flemington on Derby Day last spring as part of a five-race unbeaten campaign. Deep Field’s last race win gave the four-year-old experience on the Flemington straight course in preparation for races like the Lightning Stakes and possibly Newmarket Handicap. “John Hawkes is a genius and last preparation with Deep Field was all about this preparation,’’ Michael Hawkes said. 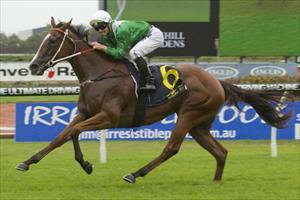 “He will go to Melbourne and have a jumpout at Flemington on Friday. Racing NSW chief steward Ray Murrihy indicated the inquiry into trainer Darren Smith’s alleged use of the prohibited substance cobalt on some of his racehorses is likely to reconvene on Monday.